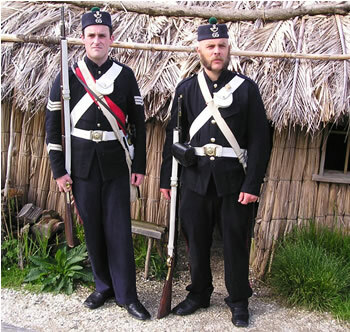 We wear the 1860s campaign uniform, worn by British units serving in New Zealand in the 1860s, of navy blue serge fatigue jacket (rather than the traditional red) and Kilmarnock (pork pie) forage cap, with standard British Enfield equipment. Some of us also have red 1856 pattern parade tunics and 1855 pattern shakos. Being literally at the ends of the Earth from England, it would have taken some time for new dress regulations to be implemented by troops in New Zealand. The voyage alone was at least 6 months. That there was a shortage of red serge in New Zealand in 1860, when the jacket was implemented. Someone realised that blue is much less conspicuous in the bush than red. There is photographic evidence of the 65th parading in New Plymouth in 1861 wearing white duck trousers, which had been abolished. They were supposed to be for use in the tropics and New Zealand is definitely temperate (much like England, only sunnier). Officers displayed their traditional lack of regard for regulation in the field. Most of them stowed their sword and equipped themselves with an Adams, Tranter, or Colt revolver and wore other ranks' fatigue jackets with no devices. During the Crimean War (1854 - 56), beards were allowed. This practice was widespread, indeed almost universal in the British Army during the 1860s. Most photographs of the period show soldiers of this regiment with huge bushy beards, unlike some other regiments. However, their hair appears to be rather short and neat. Indeed, Sheffield Grace commented in his book “The men of the 65th who paraded were shaggy, bearded giants, roughly clad, with their arms in excellent order", unlike some other regiments, recently arrived from garrison duty in Australia. Six soldiers of the Light Infantry Company, 65th Regiment. From left to right: Drummer James Kendrick (another source identifies him a Bugler Austin), Colour Sergeant [Alexander] William Acheson, Private Tobin, Lance-Corporal John Lennox, Sergeant Feltham and Sergeant (another source identifies him as Corporal) John Russell. (from Uniforms & Equipment of the British Army 1866 - original spelling retained) - my notes in brackets. Click on jump for photograph. Also see some of the research material in the page List of Changes to British Army weapons, uniforms and equipment relevant to an infantry unit during the period we portray. Rifle musket, pattern 1860 (Enfield 2 band) - with rammer, bayonet (23" sword), scabbard, muzzle stopper, snap cap with chain (for serjeants only) (unknown when/if serjeants of the 65th received these - photos of Regiment in Taranaki in 1860 shows them carrying the long rifle - I am continuing to research this. Not all sergeants in the 57th Regiment received these rifles until 1866). For a full list of where to obtain these items, see the Equipment List and Suppliers.